Looking to find those elusive Peach State ancestors? 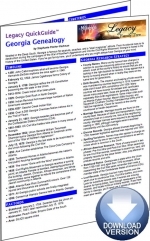 The Georgia Genealogy Legacy QuickGuide™ contains useful information including a timeline of Georgia history events, tips on Georgia research strategy, outline of major immigrant groups, and more. Also included are links to websites and resources covering vital records, church records, census records, as well as general Georgia resources. This handy 4-page PDF guide can be used on your computer or mobile device for anytime access. This was presented to a live webinar audience on April 11, 2018. 1 hour 16�minutes, plus 5 pages of handouts. The recording is also included as part of the�monthly�or�annual�membership.